sank the next day at 2:20. After 73 years the wreck was discovered on September 1, 1985, 12,500 feet beneath the North Atlantic at 41 degrees 43' 32"N, 49 degrees 56' 49"W.
Propulsion: 25 double-ended and 4 single-ended Scotch boilers at 215 psi. Two four-cylinder triple-expansion reciprocating engines each producing 15,000 hp (12 MW) at a speed of 75 rpm for outer two propellers. One low-pressure (about 7 psi absolute) steam turbine producing 16,000 hp (13.5 MW) for the centre propeller at 165 rpm. Total 46,000 hp at 75 rpm; 59,000 hp at 83 rpm (37 MW). Two bronze triple-blade side propellers. The RMS Titanic, a British Olympic class ocean liner, became famous as the largest ocean liner built in her day and infamous for sinking on her maiden voyage, in 1912. This event ranks as one of the worst peacetime maritime disasters in history. On the night of April 14, at 11:40 p.m., the ship struck an iceberg and sank in just under three hours with the loss of approximately 1500 lives. There are many descriptions of the disaster by the surviving passengers and crew and the sinking has been the subject of numerous investigations. The sinking of the RMS Titanic was a factor that influenced later maritime practices, ship design, and the seafaring culture. In the early part of the twentieth century, White Star Line sought to compete with the rival Cunard Line, which then dominated the luxury niche for Atlantic transit, with the large and opulent Lusitania and Mauretania, which were the fastest and largest liners afloat. White Star ordered three ships to provide a weekly express service with the goal of dominating the transatlantic travel business. The Olympic and Titanic at 882 feet long were larger, but not as fast as the Cunard liners. The third ship, to be named Gigantic, was just over 900 feet long; however, the name was changed to Britannic prior to completion. These larger ships offered greater amenities than the Cunard sister ships. Titanic was designed by Harland and Wolff chairman William Pirrie, head of Harland and Wolff's design department, Thomas Andrews, and general manager Alexander Carlisle, with the plans regularly sent to the White Star Line's managing director J. Bruce Ismay for suggestions and approval. Construction of the Titanic, funded by the American J.P. Morgan and his International Mercantile Marine Co., began on March 31, 1909. Titanic No. 401 was launched two years and two months later on May 31, 1911. Titanic's outfitting was completed March 31, the following year. Titanic was 882 feet 9 inches (269 m) long and 92 feet 6 inches (28 m) at the beam. She had a Gross Register Tonnage of 46,328 tons, and a height from the water line to the boat deck of 60 feet (18 m). Her three propellers were driven by two four-cylinder, triple-expansion, inverted reciprocating steam engines and one low-pressure Parsons turbine. Steam was provided by 25 double-ended and 4 single-ended Scotch-type boilers fired by 159 coal burning furnaces that made possible a top speed of 23 knots (43 km/h). Only three of the four 63 foot (19 m) tall funnels were functional; the fourth, which served only as a vent, was added to make the ship look more impressive. Titanic could carry a total of 3,547 passengers and crew and, because she carried mail, her name was given the prefix RMS, (Royal Mail Steamer). Contemporaries considered the Titanic the pinnacle of naval architecture and technological achievement, and she was thought by The Shipbuilder magazine to be "practically unsinkable." Titanic had a double-bottom hull, containing 44 tanks for boiler water and ballast to keep the ship safely balanced at sea (later ships also had a double-walled hull). Titanic exceeded the lifeboat standard, with 20 lifeboats (though not enough for all passengers). Titanic was divided into 15 compartments. Dividing doors were held up in the open position by electro-magnetic latches that could be closed by a switch on the ship's bridge and by a float system installed on the door itself. The Grand Staircase of the Olympic: identical to the Titanic's first class section. In her time, Titanic surpassed all rivals in luxury and opulence. She offered an on board swimming pool, a gymnasium, a Turkish bath, libraries for each passenger class, and a squash court. First-class common rooms were adorned with elaborate wood paneling, expensive furniture and other decorations. In addition, the Café Parisien offered superb cuisine for the first-class passengers, with a sunlit veranda fitted with trellis decorations. The ship incorporated technologically advanced features for the period. She had an extensive electrical subsystem with steam-powered generators and ship-wide electrical wiring feeding electric lights. She also boasted two wireless Marconi sets, including a powerful 1,500-watt radio manned by operators who worked in shifts, allowing constant contact and the transmission of many passenger messages. The Titanic closely resembled her older sister, Olympic, but there were a few differences. Two of the most noticeable were that half of the Titanic's forward promenade A-Deck (below the lifeboat deck) was enclosed against outside weather, and her B-Deck configuration was completely different from the Olympic's. The Titanic had a specialty restaurant called Café Parisien, a feature that the Olympic did not have until 1913. Some of the flaws found on the Olympic, such as the creaking of the aft expansion joint, were corrected on the Titanic. The skid lights that provided natural illumination on A-deck were round, while on Olympic they were oval. The Titanic's wheelhouse was made narrower and longer than the Olympic's. These, and other modifications, made the Titanic 1,004 gross tons larger than the Olympic. The Titanic was captained by Commander Edward John Smith, the White Star Line's most prized captain. The ship's original chief officer was to be William Murdoch, but he was demoted to first officer after Smith brought with him his chief officer from the Olympic, Henry T. Wilde. The rest of the ship's officers were Second Officer Charles Lightoller, Third Officer Herbert Pitman, Fourth Officer Joseph Boxhall, Fifth Officer Harold Lowe, and Sixth Officer James Moody. Second-class passengers included journalist Lawrence Beesley, Father Thomas R.D. Byles, a Catholic priest on his way to the United States to officiate at his younger brother's wedding. Michel Navratil, a Frenchman who had kidnapped his two sons, Michel Jr. and Edmond, and Sylvia Mae Caldwell, who later married the founder of State Farm Insurance, George J. Mecherle. Both J. P. Morgan and Milton S. Hershey had plans to travel on the Titanic, but canceled their reservations before the voyage. In 2007, scientists using DNA analysis identified the body of an unknown child recovered shortly after the incident as Sidney Leslie Goodwin, a 19-month-old boy from England. Goodwin, along with his parents and five siblings, boarded in Southampton, England, as third-class passengers. Photograph of an iceberg in the vicinity of the RMS Titanic’s sinking taken on April 15, 1912 by the chief steward of the liner Prinz Adelbert. On April 10, 1912, the Titanic left Southampton, England, and traveled to Cherbourg, France, where many first-class passengers boarded. On April 11, 1912, the Titanic left Cherbourg en route to Queenstown (Cobh), Ireland where the Titanic picked up the majority of its third-class passengers. On April 12, 1912, the Titanic left on its maiden voyage across the Atlantic Ocean and was due to arrive in New York City, on Wednesday April 17, 1912. On the night of April 14, at 11:40 p.m., the Titanic struck an iceberg. The ship sank, with great loss of life, at 2:20 a.m., on April 15, 1912. The United States Senate investigation reported that 1,517 people perished in the accident, while the British investigation has the number at 1,490. Regardless, the disaster ranks as one of the worst peacetime maritime disasters in history, and is by far the best known. The media frenzy about the Titanics famous victims, the legends about what happened on board the ship, the resulting changes to maritime law, Walter Lord's 1955 non-fiction account A Night to Remember, the discovery of the wreck in 1985, by a team led by Robert Ballard and Jean-Louis Michel, and the box office success of the 1997 film Titanic (the highest-grossing film in history) have sustained the Titanic's fame. The conclusion of the British Inquiry into the sinking was "that the loss of the said ship was due to collision with an iceberg, brought about by the excessive speed at which the ship was being navigated." At the time of the collision, it is thought that the Titanic was at her normal cruising speed of about 22 knots, which was less than her top speed of around 24 knots. It was then common practice to maintain normal speed in areas where icebergs were expected. It was assumed that any iceberg large enough to damage the ship would be seen in sufficient time to be avoided. After the sinking, the British Board of Trade introduced regulations instructing vessels to moderate their speed if they were expecting to encounter icebergs. It is often alleged that J. Bruce Ismay instructed or encouraged Captain Edward Smith to increase speed in order to make an early landfall, and is a common feature in popular representations of the disaster. However there is no evidence for this having occurred. The Titanic did not carry sufficient lifeboats for all of her passengers and crew. The law at that time stipulated that a minimum of 16 lifeboats and enough places for 962 occupants were required for a ship that weighed more than 10,000 tons. This law was issued in 1894, when the largest emigrant steamer was the Lucania, of 12,952 tons. It had not been updated for 18 years, and ships had increased rapidly in size. Thus, the Titanic was only legally required to carry enough lifeboats for 962 occupants (the ship had room for 3,547 passengers). The White Star Line exceeded the regulations by including four collapsible lifeboats, bringing total lifeboat capacity to 1,178. In the busy North Atlantic Ocean sea lanes, it was expected that in the event of a serious accident, help from other vessels would be quickly obtained and that the lifeboats would be used to ferry passengers and crew from the stricken vessel to her rescuers. Full provision of lifeboats was not considered necessary for this. During the design of the ship, it was anticipated that the British Board of Trade might require an increase in the number of lifeboats at some future date. Therefore, lifeboat davits capable of handling up to four boats per pair of davits were designed by Alexander Carlisle and installed to give a total potential capacity of 64 boats. The additional boats were never fitted. It is often alleged that J. Bruce Ismay, the president of White Star, vetoed the installation of these additional boats to maximize the passenger promenade area on the boat deck. Harold Sanderson, Vice President of International Mercantile Marine, denied this allegation during the British Inquiry. The lack of lifeboats was not the only cause of the tragic loss of lives. After the collision with the iceberg, one hour was taken to evaluate the damage, recognize what was going to happen, inform first-class passengers, and lower the first lifeboat. Afterwards, the crew worked quite efficiently, taking a total of 80 minutes to lower all 16 lifeboats. The crew was divided into two teams, one on each side of the ship, and an average of 10 minutes of work was necessary for a team to fill a lifeboat with passengers and lower it. Yet another factor in the high death toll that related to the lifeboats was the reluctance of the passengers to board them. They were on a ship deemed to be "unsinkable." Because of this, some lifeboats were launched with far less than capacity, the most notable being Lifeboat #1, with a capacity of 40, launched with only 12 people aboard. Included in the first launched were lifeboats 6, 7, and 8, each of which were equipped to hold 65 but evacuated the ship with only 28 on board each boat. The excessive number of casualties has also been blamed on the "women and children first" policy for places on the lifeboats. Although the lifeboats had a total capacity of 1,178—enough for 53 percent of the 2,224 persons on board—the boats launched only had a capacity of 1,084, and, altogether only 712 people were actually saved—32 percent of those originally on board. This is a result when the 1,084-person capacity of the lifeboats actually launched had sufficient room to include all of the 534 women and children on board, plus an additional 550 men (of which there were 1,690 on board). It has been suggested based on these figures that allowing one man on board for each woman or child from the start would not only have increased the number of women and children saved but also had the added benefit of saving more lives in total. As it was, the many desperate men had to be held off at gunpoint from boarding the lifeboats, adding to the chaos of the scene, and there were many more casualties—of women, children and men—than otherwise. There is speculation that if Titanic had not altered its course but reversed its engines and had run head-on into the iceberg, the damage would only have affected the first or first two compartments. The ship had three propellers; reciprocating steam engines drove the outboard propellers, and a steam turbine drove the center propeller. The reciprocating engines were reversible, but the turbine was not; however, reversing the rotation was not instantaneous and may not have been possible in the short time between sighting and impact. The liner SS Arizona had such a head-on collision with an iceberg in 1879, and, although badly damaged, managed to make it to St John's, Newfoundland for repairs. Some dispute that Titanic would have survived such a collision, however, since Titanic's speed was higher than Arizona's, her hull much larger and mass much greater, and the violence of the collision might still have compromised her structural integrity. Women's Titanic Memorial in Washington, D.C.. Soon after the discovery of the wreck site of the Titanic, scientists, naval architects, and marine engineers began questioning how faulty design features and poorly manufactured materials may have played a role in her sinking. Numerous ideas have been suggested, including poorly designed safety doors, brittle steel and the variable quality of rivets that attached the hull plating together. However, it is more likely that a combination of these issues and other circumstances were major contributing factors to the sinking. It is possible that if the watertight bulkheads had completely sealed the ship's compartments, the ship would have stayed afloat (these only went 3 m above the waterline). Titanic's hull plates were held together by rivets, metal pins which provide a means of clamping structural components together. In 1912, welding technology was still in its infancy, and shipbuilders would continue to utilize riveting almost exclusively for the next 20 years. Critical metallurgical issues have been identified with Titanic rivets salvaged from the wreck site. While most riveted ships of the era managed to stay afloat following collisions, the wrought iron rivets used in Titanic had significant flaws in strength and structure which would not have been detected with the inspection techniques of the early 20th century. Modern day forensic metallurgists suggest that the rivets of the Titanic were of substandard quality, resulting in weak points that lead to structural failure during the collision. 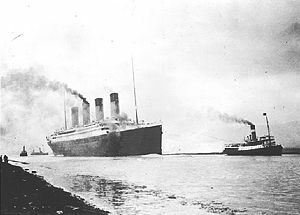 The Titanic disaster led to the convening of the first International Convention for the Safety of Life at Sea (SOLAS) in London, on November 12, 1913. On January 30, 1914, a treaty was signed by the conference that resulted in the formation and international funding of the International Ice Patrol, an agency of the United States Coast Guard that, to the present day, monitors and reports on the location of North Atlantic Ocean icebergs that could pose a threat to transatlantic sea lane traffic. It was also agreed in the new regulations that all passenger vessels would have sufficient lifeboats for everyone on board, that appropriate safety drills would be conducted, and that radio communications on passenger ships would be operated 24 hours a day along with a secondary power supply, so as not to miss distress calls. In addition, it was agreed that the firing of red rockets from a ship must be interpreted as a distress signal (red rockets launched from the Titanic prior to sinking were mistaken by nearby vessels as celebratory fireworks, delaying rescue). This treaty was scheduled to go into effect on July 1, 1915, but was upstaged by World War I. The sinking of Titanic changed the way passenger ships were designed. Many existing ships, such as the Olympic, were refitted for increased safety. Besides increasing the number of lifeboats on board, improvements included reinforcing the hull and increasing the height of the watertight bulkheads. The bulkheads on Titanic extended 10 feet (3 m) above the waterline; after Titanic sank, the bulkheads on other ships were extended higher to make compartments fully watertight. While Titanic had a double bottom, she did not have a double hull; after her sinking, new ships were designed with double hulls; also, the double bottoms of other ships (including the Olympic) were extended up the sides of their hulls, above their waterlines, to give them double hulls. For 70 years after the disaster, it was widely believed that the Titanic had sunk intact. Although there were several passengers who insisted that the ship had broken in two as it sank (including Jack Thayer, who even had another passenger draw a set of sketches depicting the sinking for him), the inquiries believed the statements of the ship's officers and first-class passengers that it had sunk in one piece. In 1985, when the wreck was discovered by Jean-Louis Michel of IFREMER, Robert Ballard, and his crew, they found that the ship broke in two as it sank. It was theorized that as the Titanic sank, the stern rose out of the water. It supposedly rose so high that the unsupported weight caused the ship to break into two pieces, the split starting at the upper deck. This became the commonly accepted theory. In 2005, new evidence suggested that in addition to the expected side damage, the ship also had sustained damage to the bottom of the hull (keel). This new evidence seemed to support a less popular theory that the crack that split the Titanic in two started at the keel plates. This proposition is supported by Jack Thayer's sketches. Titanic bow as seen from the Russian MIR I submersible. The idea of finding the wreck of Titanic and even raising the ship from the ocean floor had been perpetuated since shortly after the ship sank. No attempts even to locate the ship were successful until September 1985, when a joint French-American expedition, led by Jean-Louis Michel of IFREMER and Dr. Robert Ballard of the Woods Hole Oceanographic Institution, sailing on the Research Vessel Knorr, discovered the wreck using the video camera sled Argo. It was found at a depth of 12,536 feet (3,821 m), south-east of Newfoundland, 13 nautical miles (24 km) from where Titanic was originally thought to rest. The most notable discovery the team made was that the ship had broken in two, the stern section lying 1,970 feet (600 m) from the bow section and both facing in opposite directions. There had been conflicting witness accounts of whether the ship broke apart on the surface or not, and both the American and British inquiries found that the ship sank intact. Up until the discovery of the wreck, it was generally assumed the ship did not break apart. In 2005, a theory was presented that a portion of Titanic bottom broke off right before the ship broke in two. The theory was conceived after an expedition sponsored by The History Channel examined the three hull pieces. The bow section had embedded itself more than 60 feet (18 m) into the silt on the ocean floor. Although parts of the hull had buckled, the bow was mostly intact, as the water inside had equalized with the increasing water pressure. The stern section was in much worse condition. As the stern section sank, water pushed out the air inside, tearing apart the hull and decks. The speed at which the stern hit the ocean floor caused even more damage. Surrounding the wreck is a large debris field, with pieces of the ship (including a large amount of coal), furniture, dinnerware, and personal items scattered over one square mile (2.6 km²). Softer materials, like wood and carpet, were devoured by undersea organisms, as were human remains. 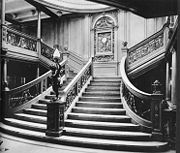 Later exploration of the vessel's lower decks, as chronicled in the book Ghosts of the Titanic by Charles Pellegrino, showed that much of the wood from Titanic's staterooms was still intact. A new theory has been put forth that much of the wood from the upper decks was not devoured by undersea organisms but rather broke free of its fixings and floated away. This is supported by some eyewitness testimony from the survivors. In April 1996, RMS Titanic Inc., which holds salvage rights to the Titanic, organized a cruise from Boston, Massachusetts, to the site of Titanic's sinking. The company intended to bring to the ocean's surface a small section of Titanic's hull among other artifacts. Among those on board the cruise ship was Titanic survivor Edith Eileen Haisman. Ms. Haisman was 15 years old when the ship sank and had vivid memories from that night. Many scientists, including Robert Ballard, are concerned that visits by tourists in submersibles and the recovery of artifacts are hastening the decay of the wreck. Underwater microbes have been eating away at Titanic's iron since the ship sank, but because of the extra damage visitors have caused, National Oceanic and Atmospheric Administration estimates that "the hull and structure of the ship may collapse to the ocean floor within the next 50 years." Several scientists and conservationists have also complained about the removal of the crow's nest on the mast by a French expedition. Ballard's book, Return to Titanic, published by the National Geographic Society, includes photographs showing the deterioration of the promenade deck and damage caused by submersibles landing on the ship. The mast has almost completely deteriorated, and repeated accusations were made that it had been stripped of its bell and brass light by salvagers. Ballard's own original discovery images however, clearly showing that the bell was never actually on the mast - it was recovered from the sea floor. The French submersible Nautile allegedly is responsible for crashing into the crow's nest and causing it to fall from the mast. Even the memorial plaque left by Ballard on his second trip to the wreck was alleged to have been removed; Ballard replaced the plaque in 2004. Recent expeditions, notably by James Cameron, have been diving on the wreck to learn more about the site and explore previously unexplored parts of the ship before Titanic decays completely. Ballard and his crew did not bring up any artifacts from the wreck. Upon discovery in 1985, a legal debate began over ownership of the wreck and the valuable artifacts inside. On June 7, 1994, RMS Titanic Inc. was awarded ownership and salvaging rights of the wreck. RMS Titanic Inc., a subsidiary of Premier Exhibitions Inc., and its predecessors have conducted seven expeditions to the wreck between 1987 and 2004, and salvaged over 5,500 objects. The biggest single recovered artifact was a 17-ton section of the hull, recovered in 1998. Many of these artifacts are part of traveling museum exhibitions. Beginning in 1987, a joint American-French expedition, which included the predecessor of RMS Titanic Inc., began salvage operations and, during 32 dives, recovered approximately 1,800 artifacts which were taken to France for conservation and restoration. In 1993, a French administrator in the Office of Maritime Affairs of the Ministry of Equipment, Transportation, and Tourism awarded RMS Titanic Inc's predecessor title to the artifacts recovered in 1987. In a motion filed on February 12, 2004, RMS Titanic Inc. requested that the District Court enter an order awarding it "title to all the artifacts (including portions of the hull) which are the subject of this action pursuant to the Law of Finds" or, in the alternative, a salvage award in the amount of $225 million. RMS Titanic Inc. excluded from its motion any claim for an award of title to the 1987 artifacts, but it did request that the district court declare that, based on the French administrative action, "the artifacts raised during the 1987 expedition are independently owned by RMST." Following a hearing, the district court entered an order dated July 2, 2004, in which it refused to grant comity and recognize the 1993 decision of the French administrator, and rejected RMS Titanic Inc's claim that it should be awarded title to the artifacts recovered since 1993 under the Maritime Law of Finds. RMS Titanic Inc. appealed to the United States Court of Appeals. In its decision of January 31, 2006, the court recognized "explicitly the appropriateness of applying maritime salvage law to historic wrecks such as that of Titanic" and denied the application of the Maritime Law of Finds. The court also ruled that the district court lacked jurisdiction over the "1987 artifacts," and therefore vacated that part of the court's July 2, 2004, order. In other words, according to this decision, RMS Titanic Inc. has ownership title to the artifacts awarded in the French decision (valued $16.5 million earlier) and continues to be salvor-in-possession of Titanic wreck. 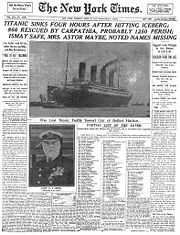 ↑ History on the Net, The Titanic Why Did People Believe Titanic Was Unsinkable? Retrieved December 10, 2007. ↑ Titanic Model, Titanic's Blueprints Retrieved November 23, 2007. ↑ Titanic Inquiry, Report on the Loss of the S.S. Titanic. Retrieved November 23, 2007. ↑ Titanic Inquiry, Final Report of the British Board of Trade Inquiry. Retrieved December 10, 2007. ↑ Titanic Inquiry, British Inquiry—Testimony of JG Boxhall—Fourth Officer—ss Titanic, Q15645 Retrieved December 10, 2007. ↑ Titanic Inquiry, British Inquiry—Testimony of G Affeld, Marine Superintendent Red Star Line Q22583 & Q25615/16. Retrieved December 10, 2007. ↑ Titanic1.org, Paul Louden-Brown The White Star Line; An Illustrated History 1869-1934. Retrieved December 10, 2007. ↑ Titanic Inquiry, Testimony of Alexander Carlisle at British Inquiry Retrieved December 10, 2007. ↑ Titanic Inquiry, Testimony of Harold Sanderson at British Inquiry—Question #19398. Retrieved December 10, 2007. ↑ Logoi.com, Women and children first. Retrieved December 10, 2007. ↑ Ithaca University, Titanic: Demographics of the Passengers. Retrieved December 10, 2007. ↑ Whoi.edu, Woods Hole Oceanographic Institution: Discovery of the Titanic Retrieved December 10, 2007. ↑ Encyclopedia Titanica, Oldest Titanic survivor plans visit to site. Retrieved December 10, 2007. ↑ RMS Titanic.net, Corporate Profile. Retrieved December 10, 2007. ↑ RMS Titanic.net, Expeditions. Retrieved December 10, 2007. PBS Online - Lost Liners. Ocean Planet: How Deep Can they Go?. This page was last modified on 22 June 2015, at 17:33.